Original Editors - Kevin Beale from Bellarmine University's Pathophysiology of Complex Patient Problems project. Reported cases of Lyme Disease in the U.S. in 2015. Image from CDC, available at http://www.cdc.gov/lyme/. According to the CDC's collection of data from identified cases of Lyme disease counts by each county in the United States, there were 201,923 cases of Lyme disease reported from 2010 to 2015. The incidence of Lyme disease has fluctuated over the years, however still showing a steady increase from 30,158 confirmed cases in 2010 to 38,069 confirmed cases in 2015. 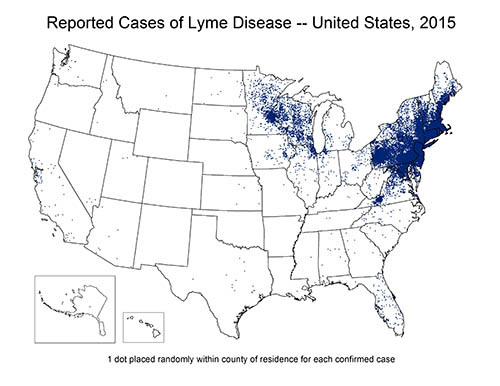 Lyme disease is the most prevalent vectorbourne illness reported in the United States, according to date from the CDC. Most cases develop during the summer months of May through August when individuals are more likely to visit wooded areas for work or recreation and tick nymphs are most active. Children 5 to 14 years of age have the highest rate of incidence with an average of 8.6 cases per 100,000 compared to 3.0 cases per 100,000 for people 20 to 24 and 7.8 cases per 100,000 for ages 55 to 59. .
Lyme disease is clinically similar to <a href="http://www.nlm.nih.gov/medlineplus/ency/article/001327.htm">syphilis</a>, a disorder which also can affect multiple organ systems and is also caused by a spirochete bacterium. It also may occur in stages, progressing from a localized presentation (Stage 1) to a widespread infection involving neurological, musculoskeletal, and cardiac findings (Stage 2) to a final stage in which infection persists chronically resulting in long-term neurological symptoms, arthritis, and cognitive deficits (Stage 3).<span class="fck_mw_ref" _fck_mw_customtag="true" _fck_mw_tagname="ref" name="Pathology" /> Because the presentation of the disease is so variable, it can be exceedingly difficult for healthcare professionals to diagnose. In addition, because it can so closely mimic other disorders such as <a href="MS Multiple Sclerosis">multiple sclerosis</a>, <a href="Fibromyalgia">fibromyalgia</a>, <a href="Chronic Fatigue Syndrome">chronic fatigue syndrome</a>, and <a href="Guillain-Barre Syndrome">Guillain-Barré syndrome</a>, it is frequently called "The Great Imitator." Signs ang symtoms of Lyme Disease. Image from CDC, available http://www.cdc.gov/lyme/. Fever or other general symptoms may occur even with the absence of a rash. A small bump or redness at the site of a tick bite that occurs immediately and can resemble a mosquito bite, is common. This irritation generally goes away quickly (1-2 days) and is not an indicator of Lyme disease. A rash with a similar appearance to EM occurs with Southern Tick-associated Rash Illness (STARI), but has no relation to Lyme disease. 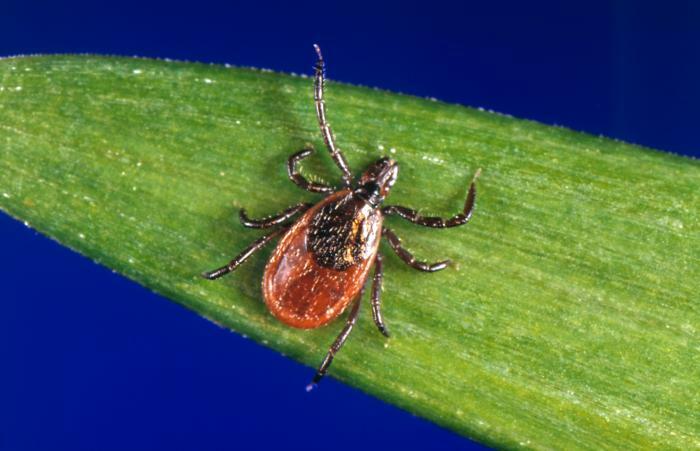 Ticks can spread other organisms (https://www.cdc.gov/ticks/diseases/index.html) that can cause a different form of rash (https://www.cdc.gov/ticks/symptoms.html). 10-20% of people with untreated Lyme disease will develop chronic arthritis. Lyme arthritis primarily affects only a few joints (knee is the most common), but can shift from one joint to another, primarily large joints such as elbow, shoulder and hip. Babesia microti is a parasite that enters the bloodstream along with Borrelia at the time of the tick bite and attacks and destroys the host’s red blood cells. It can be potentially life-threatening, especially in individuals who are elderly, immuno-compromised, do not have a spleen, or have other diseases involving the kidney or liver. If not treated, complications can include hemodynamic instability, anemia, <a href="http://www.nlm.nih.gov/medlineplus/ency/article/000586.htm">thrombocytopenia</a>, organ failure, or death. Individuals who present with symptoms of significant fatigue and malaise consistent with a diagnosis of <a href="http://www.nlm.nih.gov/medlineplus/ency/article/001244.htm">Chronic Fatigue Syndrome</a> often test positive for Borrelia antibodies, suggesting a prior infection even in individuals with no previous clinical diagnosis of Lyme disease. In a double-blind study performed in Germany in 1999, researchers found that individuals who tested positive for Borrelia antibodies and had a history of tick bites were significantly more likely to report symptoms of fatigue and malaise than individuals who had a history of tick bites but tested negative for Borrelia antibodies. Similar studies have found temporal links between Borrelia infection and the development of clinically diagnosable <a href="Fibromyalgia">fibromyalgia</a>, the etiology of which is generally multifactorial and can be triggered by environmental factors, trauma, stress, infection, and possibly vaccination. Cardiac problems arising as a result of Lyme disease may occur in 4 to 10% of affected individuals. Potential problems include <a href="http://www.nlm.nih.gov/medlineplus/ency/article/000149.htm">myocarditis</a>, heart conduction block, and arrhythmia. Symptoms of cardiac involvement include bradycardia, tachycardia, irregular heartbeat, dizziness, syncope, and shortness of air. Although controversy exists over whether or not autism is truly a co-morbidity of Lyme disease, recent research shows a correlation between the two. Chronic infectious diseases including the Borrelia organism that causes Lyme have been associated with other co-infections that may weaken the fetal or infant immune system, putting affected individuals at increased risk for developing <a href="http://www.nlm.nih.gov/medlineplus/ency/article/001526.htm">autism</a> spectrum disorders. Always check for ticks whenever coming from outdoors. Risk of Lyme disease is minimized when tick is removed within 36 hours. Lyme disease is generally diagnosed via a two-step process recommended by the CDC. First, the affected individual’s blood is tested for antibodies to Borrelia with either with an enzyme immunoassay (EIA) or Immunofluorescence Assay (IFA) tests. If either test is positive, the diagnosis is confirmed with a Western blot test. It should be noted that antibodies may not appear for 1 to 2 weeks after the initial infection. Therefore, blood tests may give negative results in the acute stage of the infection. 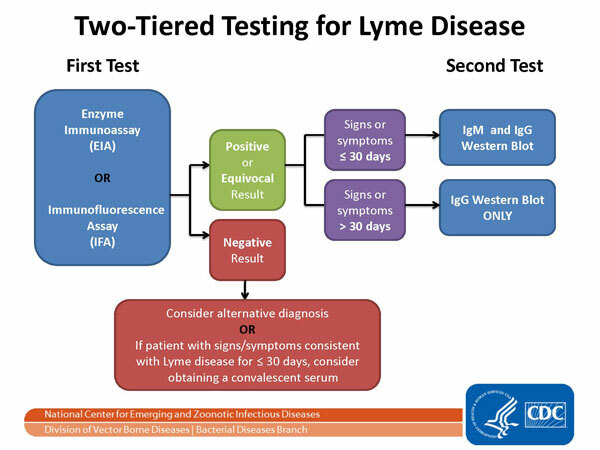 Two-tiered testing for diagnosis of Lyme Disease. Image from CDC, available at http://www.cdc.gov/lyme/. Lyme disease is caused by spirochete microorganisms in the family Borrelia (in the United States, the specific species involved is Borrelia burgdorferi) which are transmitted primarily by blacklegged or deer ticks. Deer ticks generally feed on the blood of deer, small birds, and mice, but are opportunistic and will also feed on the blood of other hosts such as cats, dogs, horses, and humans. Infected deer ticks transmit the bacteria to their host during the process of feeding. Risks for being bitten by a tick capable of transmitting Borrelia bacteria include spending time outdoors in wooded or grassy areas especially in the Northeast and Midwest (see Prevalence section above). Walking in wooded or grassy areas in shorts and/or short sleeves increases the risk because of the higher surface area of exposed skin. The risk of acquiring an infection also increases if a tick is allowed to remain attached to the body for more than 48 hours, allowing it to take in a full “blood meal.” If a tick is identified and removed prior to that time, the risk of infection is low. Lyme disease, especially if left untreated, may involve multiple systems as detailed in the Characteristics/Clinical Presentation section above. If the infection is allowed to progress from a localized one at the site of the tick bite to a systemic one, it may affect the central nervous, cardiac, and musculoskeletal systems. Because length and severity of symptoms can vary widely based on the stage at which Lyme disease is diagnosed, prevention is the key to avoiding infection. When individuals who live in tick-infested areas take appropriate preventive measures, the risk of infection is greatly reduced. The CDC has published a comprehensive guide to Lyme disease prevention and control, available <a href="http://www.cdc.gov/ncidod/dvbid/LYME/ld_prevent.htm">here</a>. The FDA approved a vaccine for Lyme disease called LYMErix in 1998. However, the company who manufactured the vaccine ceased production in 2002 because of its high cost and lackluster sales. At this time, there are no alternative vaccinations available for the disease. Though there is little evidence as to its efficacy, some physicians recommend a single dose of the oral antibiotic doxycycline to prevent infection when ticks are found to have been attached for 36 to 72 hours. Current best evidence indicates the same treatments discussed in the Medications section above. Acute cases are initially treated with a 14 to 21 day course of oral antibiotics such as doxycycline or amoxicillin. If neurological impairments or a third degree heart block exists, IV antibiotics such as ceftriaxone are administered for 14 to 28 days. Lyme arthritis is also usually treated with oral antibiotics. If lyme-related muscle and joint pain persists after the first course of antibiotics, an additional four week course is recommended. Arthritic symptoms that persist beyond both courses of antibiotic treatment are treated with antirheumatic and nonsteroidal anti-inflammatories. Lyme arthritis is a condition which is a late manifestation of Lyme disease. Approximately 60% of patients with untreated Lyme disease will develop Lyme arthritis. Initial treatment is antibiotics and some patients respond well but other can experience post-infectious antibiotic-refractory arthritis. According to a study that reviewed 30 patients with Lyme's Arthritis, these patients require an alternative plan for treatment. This study that looked at 30 patients who had developed a new-onset systemic autoimmune joint disorder approximately 4 months after Lyme disease (usually manifested by erythema migrans [EM]). Chronic Lyme disease is a condition of persistent symptoms associated with Lyme disease after the infection and the appropriate course of care and antibiotics. It is debated that patients with Chronic Lyme disease may have underlying syndromes or disease and question the presence of the infection in the individual. The symptoms associated with Chronic Lyme disease include disabling fatigue, severe headaches, and diffuse muscle or joint pain. These symptoms often mimic fibromyalgia and chronic fatigue syndrome. Studies suggest that Chronic Lyme disease is not related to the infection, evidence of the absence of the spirochete infection in the synovial fluid post treatment, while it was present during the infection. This hypothesized that Chronic Lyme disease is a result of a neurohormonal or immunological response of the body after the infection is treated. Early stage Lyme disease can only be treated with antibiotics and other adjunct medications such as analgesics. However, some doctors will refer patients with chronic Lyme disease symptoms that do not respond to medication to physical therapy. According to a physician's guide developed for the Lyme Disease Association, Inc., the role that physical therapy plays in the treatment of Lyme disease is primarily to relieve pain, prepare de-conditioned patients to begin a home-based exercise program, and to educate patients regarding proper exercise technique and frequency, duration, and resistance appropriate to achieve wellness benefits without exacerbating Lyme-related symptoms. Direct physical therapy interventions include massage, range of motion, myofascial release, and modalities including ultrasound, moist heat, and paraffin. Generally, ice packs and electrical stimulation are contraindicated, though there is no research to support this. Exercise prescription is aimed at improving strength and gradually increasing the patient's conditioning level which may be severely impaired as a result of chronic Lyme infection. Whole-body workouts generally feature extensive stretching, light calisthenics, and light resistance training with low loads and high repetitions. In addition, many patients with specific neurological complications such as <a href="Facial Palsy">facial nerve paralysis</a> may also be referred for physical therapy. Electrical stimulation of paralyzed or weak facial muscles following Lyme-related neurological insult is considered a fairly common practice, though the research does not fully support its use. There are few randomized controlled trials investigating its effectiveness and those that do exist indicate that it may be neither harmful nor beneficial with many therapists taking a conservative approach and waiting several months between symptom onset and initiation of an e-stim program to allow natural neurological recovery to occur. Neuromuscular retraining has been demonstrated to be beneficial in facial palsy, as has EMG biofeedback. Physical Therapists should be aware of the signs of Lyme Arthritis which typically manifests approximately four months after Erythema Migrans. It is most common in the knee but can be found in multiple joints. The diagnosis of Lyme disease requires the practitioner to consider the different presentations that may occur based on the acuity of the Borrelia infection. Thus, the list of differential diagnoses below is categorized by Lyme disease stage - localized infection (Stage I), disseminated infection (Stage II), and persistent infection (Stage III). ↑ 2.0 2.1 2.2 2.3 2.4 2.5 Lyme Disease. Centers for Disease Control and Prevention. http://www.cdc.gov/lyme. Published August 19, 2016. Accessed March 23, 2017. ↑ 3.0 3.1 3.2 Goodman CC, Fuller K. Pathology: Implications for the Physical Therapist. 4th ed. St. Louis: Saunders Elsevier; 2014. ↑ CDC Division of Vector-borne Infectious Diseases website. Lyme Disease. Available at http://www.cdc.gov/ncidod/dvbid/Lyme. Accessed February 18, 2010. ↑ Steere AC. Lyme disease. N Eng J Med. 1989;321:586-596. ↑ Goodman CC, Snyder TK. Differential Diagnosis for Physical Therapists: Screening for Referral. 4th ed. St. Louis: Saunders Elsevier; 2007. ↑ Goodman CC, Snyder TK. Differential Diagnosis for Physical Therapists: Screening for Referral. 5th ed. St. Louis: Saunders Elsevier; 2013. ↑ Babesia. CDC website. Available at http://www.cdc.gov/babesiosis. Accessed February 24, 2010. ↑ Treib J, Grauer M, Haass A, Langenbach J, Holzer G, Woessner R. Chronic fatigue syndrome in patients with lyme borreliosis. Eur Neurol [serial online]. 2000 Feb;43(2):107-109. ↑ Buskila D, Atzeni F, Sarzi-Puttini P. Etiology of fibromyalgia: The possible role of infection and vaccination. Autoimmunity Reviews [serial online]. 2008 Oct;8(1):41-43. ↑ Rudnik I, Konarzewska B, Zajkowska J, Juchnowicz D, Markowski T, Pancewicz S. [The organic disorders in the course of Lyme disease]. Polski Merkuriusz Lekarski: Organ Polskiego Towarzystwa Lekarskiego [serial online]. 2004 Apr;16(94):328-331. ↑ Bransfield R, Wulfman J, Harvey W, Usman A. The association between tick-borne infections, Lyme borreliosis and autism spectrum disorders. Medical Hypotheses [serial online]. 2008;70(5):967-974. ↑ 14.0 14.1 Lyme Disease. New England Journal of Medicine. 2014;371(7):683-684. doi:10.1056/nejmc1407264. ↑ Mayo Clinic website. Lyme Disease. Available at http://www.mayoclinic.com/health/lyme-disease/DS00116. Accessed February 25, 2010. ↑ Cadavid D, Auwaerter P, Aucott J, Rumbaugh J. Treatment for the neurological complications of Lyme Disease (Protocol). Cochrane Database of Systematic Reviews 2009. Issue 1. ↑ 17.0 17.1 Arvikar S, Crowley J, Sulka k, et al. Autoimmune Arthritides, Rheumatoid Arthritis, Psoriatic Arthritis, or Peripheral Spondyloarthritis Following Lyme Disease: Arthritis; Rheumatology. Published online December 28, 2016. DOI: 10.1002/art.39866. ↑ Ohtake PJ, Zafron ML, Poranki LG, Fish DR. Evidence in Practice. Physical Therapy. 2006;86:1558-1564. ↑ Differential Diagnosis of Lyme Disease. Lyme Disease Update Review. Available at http://www.lymediseasereview.com/differential-diagnosis-of-lyme-disease. Accessed March 1, 2010. ↑ Salzman B, Studdiford J. Early Lyme disease: solving the subtle clinical clues in an elderly patient. Clinical Geriatrics [serial online]. April 2007;15(4):20. ↑ Manku K, Seifeldin R, Hemady N. Case report: the changing face of Lyme disease -- rural to urban. Hospital Physician [serial online]. 2005;41(1):20-24. ↑ Morrison C, Seifter A, Aucott JN. Unusual presentation of lyme disease: horner syndrome with negative serology. J Am Board Fam Med 2009;22:219-222. ↑ Salzman BE, Stonehouse A, Studdiford J. Late diagnosis of early disseminated lyme disease: perplexing symptoms in a gardener. J Am Board Fam Med. 2008;21(3):234-236.